Oh boy – I’m not sure what I got myself into, but I’ve joined in with Z of Playamart http://playamart.wordpress.com/2013/05/23/timeout-for-art-drawing-paying-attention/to draw for 30 minutes each Thursday. I haven’t been drawing lately and decided it’s a good way to polish my drawing skills and discipline myself to pay attention and concentrate on my subjects – drawing always had a way of doing that for me. So I’ve decided to use 30 minutes on Thursdays to do the exercise, only with my own take on it. Using one subject it will only be worked on for 30 minutes once/week, over time you’ll see the whole come together. I’ve decided to do a portrait drawing of a man and his horse based on a photograph by Ruth Archer. A friend of hers takes in unwanted racehorses to give them a chance and save them from an uncertain fate. Ruth took a photograph of a magnificent colt, Pacific Reach, who is one of the lucky ones. Her image captured a moment of kindness and understanding between horse and an older gentleman that I hope to convey in my drawing. I expect this will take me weeks, if not months to draw, if only working on it 30 minutes once/week – so over time you’ll get to see my progress and if you have patience with me hopefully the end result will be well worth the time. What I have posted here is just a sample sketch (5×7) to get a feel for the full-sized portrait drawing. Next week I will start the actual drawing on a 9 x 12 Bristol Vellum surface. Do you think my sample sketch below will make a good subject for this project? If so, I’ll be starting next week . . . 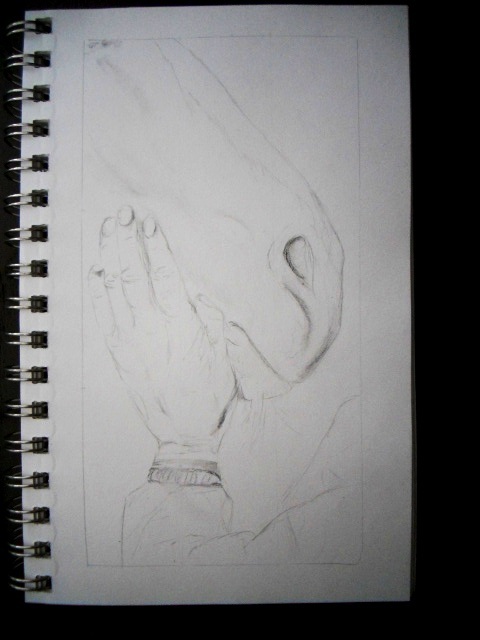 I look forward to the finished piece – perhaps we will see it in various stages? A drawing challenge is a good one. Should I go to the link to see what is happening? Happy summer! Hi! Thanks so much for your feedback – it’s taken me a bit to get back to the fine art of drawing. It’s a great exercise to force me to concentrate on what I’m seeing and not what I think is there, in turn I’m sure I’ll be applying the same discipline to my painting. I’ll continue posting updates here on my blog – an updated drawing is ready for posting today, will be uploaded in a few minutes. Thanks so much! Thanks Marilyn – appreciate your words of encouragement!! I always find horses very touching and the connection with the hand is nice. Thanks Kara, the image of the old hand against the horses head had me – so much compassion. Can I capture it? That’s my goal. It is a great composition, so I am very excited to see your work in progress. Thank you Petronette, hope I don’t disappoint. So glad you are doing this too! Thanks, I hope that means you are joining in as well – your talent is wonderful to showcase. Will be a fun experiment, don’t you think? Horses are tough, and if you can master it, it will be a true testament to you as a painter/sketch artist. Even photographing them are hard. It’s the angle of perspective, you can’t capture them head on, but rather at a little lower angle. Good luck on this project. So true! Great comment – because you’re right, the strength – power – emotion is really hard to capture with horses. I’m looking forward to having this side project, no matter how long it takes to draw, the learning experience will be worth every moment. It’s being able to show muscle structure, smoothness of the hide and strength of the beast – but above all the human-to-animal connection that we have with horses. I want to bring ‘that’ feeling to the surface. your drawing is lovely already! i respect you for stopping at thirty minutes! i worked longer on the left-handed drawing – it was so difficult to make my pencil obey my thoughts! i have continued to practice with my left hand, as i don’t like being unable to control the pencil! this is going to be so much fun! thank you for what you’re doing, and i look forward to the progress! it’s beautiful already! Left-handed, whoa that is way too ambitious for me. Actually I spent longer on this sketch, because I was just trying to see if the subject would work in evoking emotion. Next week starts the real work – so happy you challenged your followers, I’m looking forward to doing this exercise. Sure! You clearly understand the image. Looking forward to seeing your painting! Thanks Elena – there was an instant connection when I first saw the photograph. I think it will work as a portrait drawing. If all goes well, I may paint this in oil pastels as well. Fun! I’m with you – fine first 30 min! Cool! Thanks, looking forward to the project. Not at all and thanks Doris, see you next week! Very inspiring…the idea and the whole project! I’ll follow the progress. Hi Kha, thanks so much and very nice to hear from you. I’m glad you’ll be following – see you later . . .
Hi Poppy, thanks so much! Thanks Cyndi – I’m sure this will take me forever. The photograph spoke to me and I couldn’t resist trying to capture the emotion/passion – gosh we’ll see what happens. Hi Cyndi, thanks – actually think this will be fun and a great exercise to keep my drawing skills sharpened. LOL we’ll see what happens.